In 710, the capital in Asuka Period was moved to Nara. It was the end of Asuka Period and the start of the completely different time. The new capital was named as Heijo-kyo(平城京). And the leaders at that time planned to imitate the regime of China. So they made Heijo-kyo resembled Chang’an. In 630, the Japanese Imperial Court sent an envoy to Tang Dynasty China before the moving to Heijo-kyo. Due to the diverse cultures from China and other countries flew into Japan. At the era of Emperor Shomu(聖武天皇), the influence of other countries caused a new culture, Tenpyo Culture(天平文化). Emperor Shomu eagerly had proceeded the policy along with Buddhism as like Shotoku-Taishi and Tenpyo Culture had a distinctive feature with the Buddha statues and the Buddhism temples. Because the Imperial Court carried out the establishment of the legal code, they needed to set national history. Emperor Tenmu(天武天皇) ordered Hieda-no Are(稗田阿礼) to recite the myth and the oral tradition, and Oono Yasumaro(太安万侶) to write down for a record in 712. “Kojiki”(古事記, Records of Ancient Matters ) was the first historical record in Japan. In 720, they made another historical book which is called “Nihonshoki”(日本書紀). And the Imperial Court had continued to compile the national history since that time for more than 180 years. In addition, they commanded to gather information of geography and products all over the country. The report was called as “Fudoki”(風土記) before people knew. More Japanese people had became to compose Waka by Nara Period. Not only those who with high position, Imperial Families and nobles, but also farmers and monks. Ootomo-no Yakamochi(大伴家持) collected about the 4,500 poetries, which was named as “Manyoshu”(万葉集). 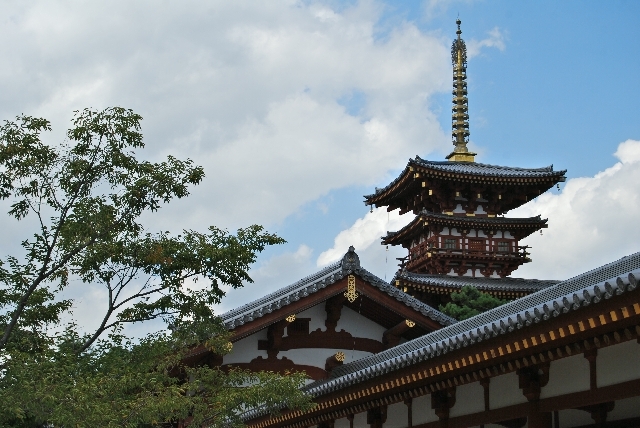 The leaders in Nara Period set Buddhism as a core of Japanse society. 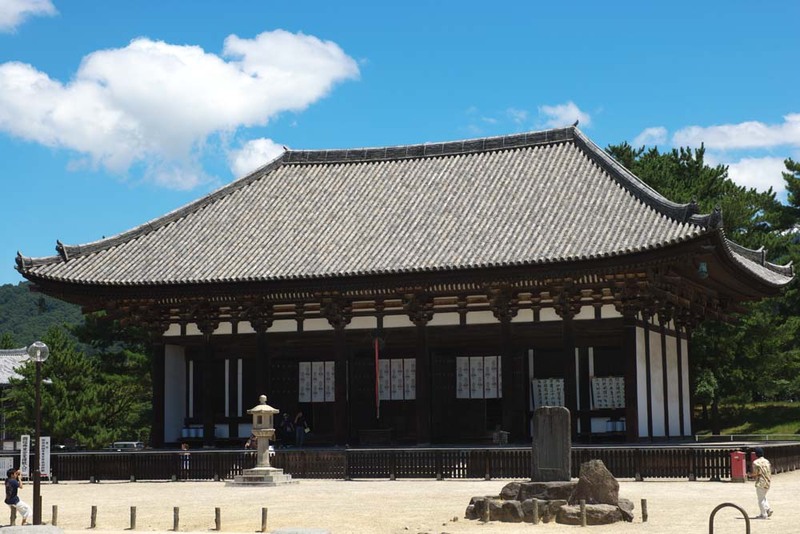 So they built many temples in Nara throughout the period. 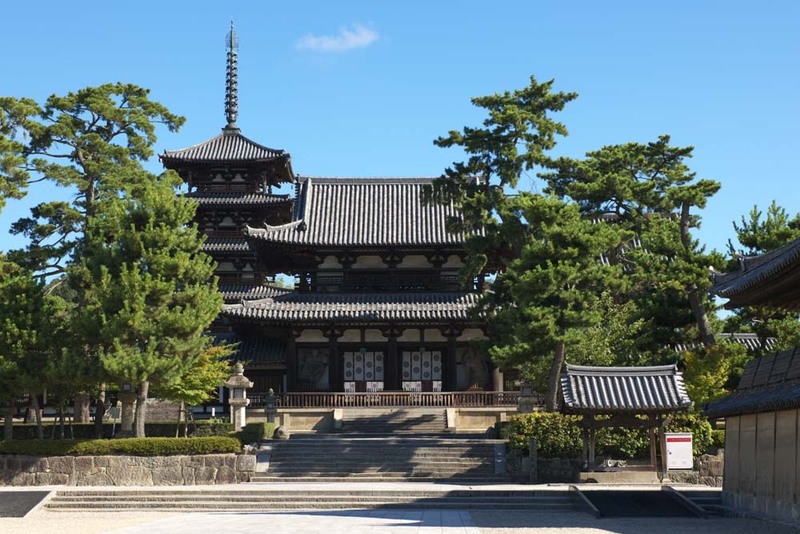 Shotoku Taishi had already established Horyuji temple in Asuka Period and people in Nara Period extended other structures including Yumedono(夢殿) in the area. Above all, Emperor Shomu built Todaiji and placed there the Great Buddha. 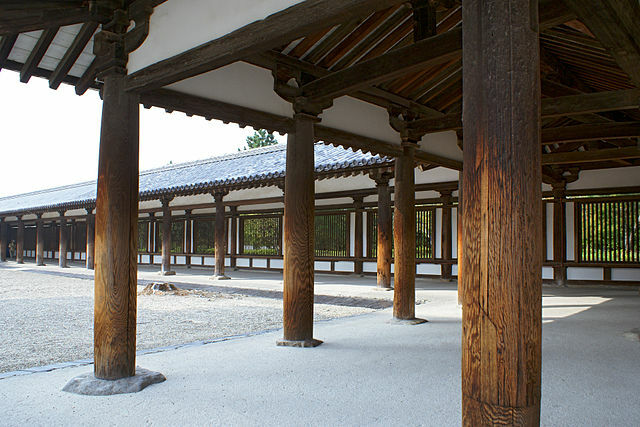 The Daibutsu-den(大仏殿, the hall for the Great Buddha) exceed other structures in the world as timber framework method. As the leaders sought a power to unite the nation, they relied on the dharmas and the influence of Buddhism. Therefore The Imperial Court established the seven great temples of Nara(Nanto-Shichidaiji, 南都七大寺）, Daianji, Gangoji, Horyuji, Kofukuji, Saidaiji, Todaiji, and Yakushiji. 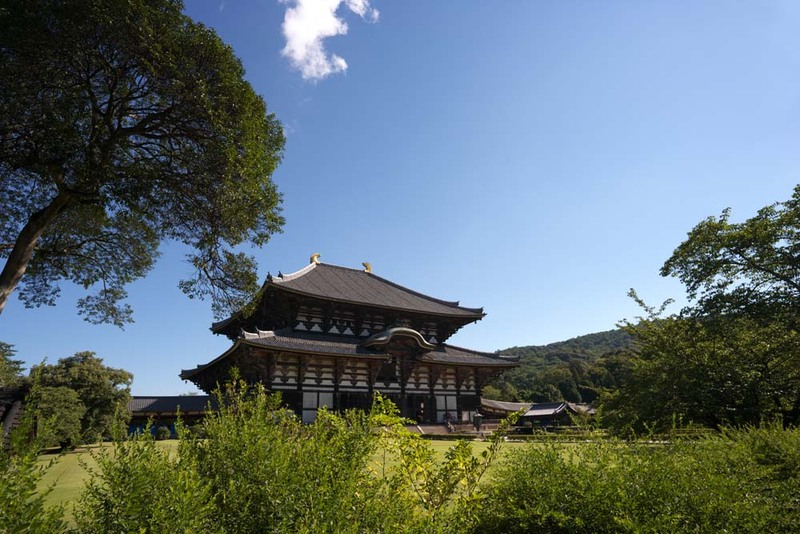 As Horyuji doesn’t locate in Nara, some people add Toshodaiji to the seven great temples. All of the structure of the main hall in Tenpyo disappeared until today excepting the Toshodaiji. 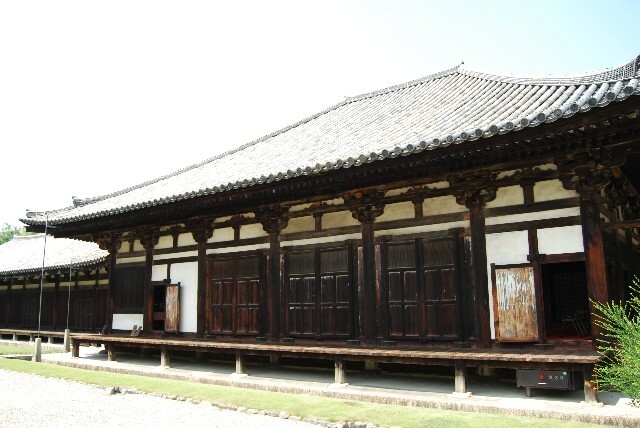 Both the sides of the hipped roof have Shibi(鴟尾) , an ornamental tile of charm against fire. And the pillars swell in the middle(entasis) just like with the corridor of Horyuji. The structure of the auditorium was changed from Kiridzuma-dzukuri(切妻造, gabled roof) into Irimoya-dzukuri(入母屋造, hip-and-gable roof structure) with the reconstruction in the 13th century. In 745, Emperor Shomu started the plan of making the Great Buddha for helping people from their suffering. The big statue amaze people who visit Todaiji still now. But you can see more other precious images at the temple. The sculptor of Buddha statue in Tenpyo Culture use the way of not only carving but also the way of molding and lacquering. All of the statues were made of a clay, so the shock of by earthquake or water of rain broke them down. After the Nara Period, the sculptor hadn’t adopted the way of molding. 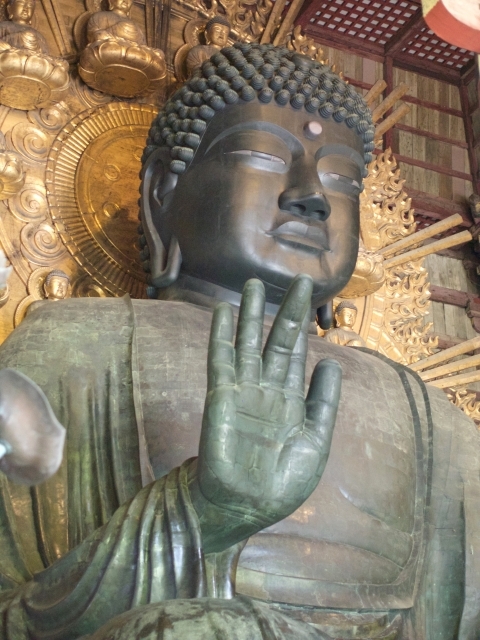 The Hokke-do(法華堂) of Todaiji contains many famous Buddha statues including Fukuken-kannon(不空羂索観音) , Nikko-bosatsu(日光菩薩), and Gakko-bosatsu(月光菩薩). At Todaiji, the images of the guardians, Shitsu-Kongozo(執金剛像) and the Four Devas, get in a line and protect the main Buddha statue. The Budda statue of Asura, one of the eight legions in Buddhism, stands in Kofukuji. Most of the Asuras express furious but the Kofukuji’s looks sad and attentive. Ganjin(鑑真) who made a voyage from China and established Toshodaiji passed away in 763. Shortly before, one of his disciples dreamed a beam of the auditorium broke and he suspected it represented his master’s death. The disciples tried to leave the images of Ganjin and made the statue in detail. That is the oldest portrait sculpture in Japan. Nara Period had a few popular paintings but “the six-panel folding screen of painted women dressed in the Tang style”(鳥毛立女屏風, Torige Ryujo-no Byobu) appears in junior high shool’s textbook of Japanese history. Shosoin(正倉院) at Horyuji holds the picture. “Kako Genzai Einga-kyo”(過去現在絵因果経) shows the previous and this life of Buddha with a style of a picture scroll. The Buddhist scripture is the oldest picture scroll in Japan. But unlikely later works, the pictures were drawn in upper line and the characters were written in lower. Shosoin puts many valuable crafts, which Empress Komyo(光明皇后, Emperor Shomu’s wife) donated her husband’s remembrance token in order. Especially one of the masterpieces, “Raden Shitan Gogen-no Biwa”(螺鈿紫檀五絃琵琶) represents arriving of the culture from East and South Asia. The guitar-like musical instrument(biwa) have five strings(gogen) and decorations of mother-of-pearl(raden), using red sandalwood as the material. The ornaments make the figure of the man and the flowers in western regions of China. Same to the biwa, “Hakururi-no Wan”(白瑠璃碗, white cut glass) traveled across the Silk Road. The researchers had thought the glass came from Persia, but the recent scientific analysis suggest the possibility of the Roman Empire. This entry was posted in Period of Japanese History and tagged Buddha statue, Buddhism, japanese paintings, myth, Nara Period, poetry, temple, Tenpyo Culture. Bookmark the permalink.